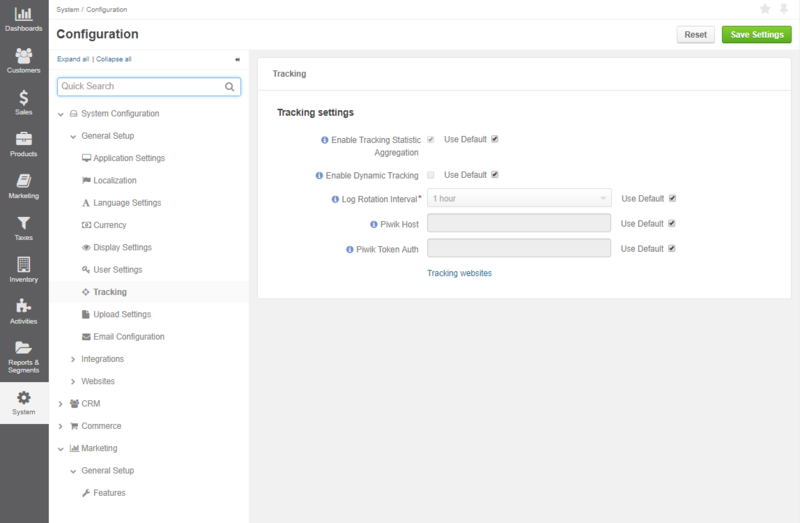 You can set up the settings that apply to all the Tracking records created in the Oro application. Select System Configuration > General Setup > Tracking in the menu to the left. To enable the data transfer to a Matomo account, the identifier field of the Tracking Website record should be the same as the Website ID used by Matomo. Clear the Use Default check box to customize the required option. Select the checkbox next to the option, choose a new value from the list, or type in the necessary information. The Reset button in the upper right corner of the page restores the latest saved values. You can navigate to the tracking website management page using the tracking website link at the bottom of the page.